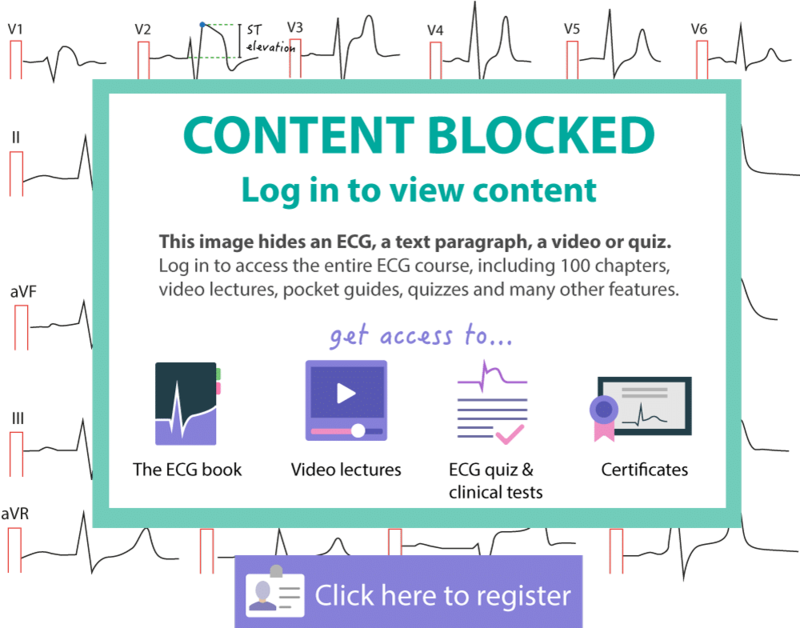 An ECG must be performed on all patients seeking medical attention due to chest discomfort or other symptoms which may be caused by myocardial ischemia. Other symptoms include dyspnea, pain radiating to the left arm/shoulder/throat, palpitations, back pain and selected cases of upper abdominal pain. An ECG recording costs approximately $2 / 2€ and may reduce morbidity and mortality substantially in patients with acute coronary syndromes. Importantly, ECG findings dictate the management of patients with acute coronary syndromes. Importantly, the ECG findings dictate management of acute coronary syndromes. 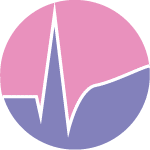 Hence, an ECG must be performed and interpreted within 10 minutes of arrival to care facility (typically the emergency room [ER]). It is recommended that the 12-lead ECG (conventional ECG) be used for interpretation of ischemia. All available ECG criteria for acute myocardial infarction and ischemia are based on conventional 12-lead ECG. Established ECG criteria do not apply to mathemathically derived 12-lead ECGs (e.g EASI, Frank’s leads etc). Note that in some situations it is appropriate to connect additional electrodes in order to detect right ventricular infarction (leads V3R, V4R, V5R, V6R) and posterolateral infarction (leads V7, V8, V9). Criteria for ischemia/infarction have been established for these leads (please refer to ECG leads or Additional leads in acute myocardial infarction). It is of paramount importance to record the ECG during ongoing chest pain, if the opportunity is given. An ECG without ischemic ST-T changes when recording during chest pain is not consistent with myocardial ischemia. In other words, chest pain caused by ischemia will always result in ischemic ST-T changes. 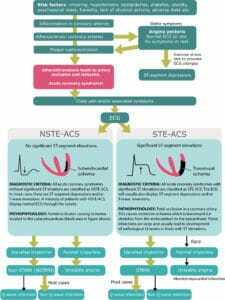 This is acknowledged in the latest recommendation issued by the International Society for Holter and Non-Invasive Electrocardiology, where it is stated that it is extremely uncommon to have a non-ischemic ECG (absence of ST-T changes) during chest pain caused by myocardial ischemia. This is corroborated by millions of exercise stress tests, where ischemic ECG changes always precede symptoms of ischemia. In summary, if an ECG recorded during chest pain does not display ischemia, then the chest pain is not caused by myocardial ischemia. The ischemic cascade explains why subjective symptoms (chest pain) always occur after ECG changes during myocardial ischemia. 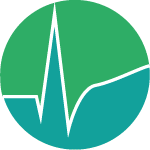 The ECG must be compared to previous ECG recordings, if such are available. ST-T changes are extremely common in every population. For example, almost 80% of men display ST segment elevations which are not caused by ischemia and a significant proportion have ST-T changes caused by other pathological conditions (such as bundle branch blocks). Comparing the ECG recordings may reveal if the ST-T segments differ; any difference may be suggestive of myocardial ischemia. It is also important to control the placement of electrodes. Incorrect placement of electrodes, or varying placement between repeated recordings, may cause significant variations in the ECG waveforms. Acute coronary syndromes are dynamic processes. Factors that promote thrombosis (pro-thrombogenic factors) are constantly in struggle with factors striving to lysate the thrombus (pro-thrombolytic factors). The balance between pro-thrombogenic and pro-thrombolytic factors vary from one minute to another, which may cause variations in the size of the thrombus. This means that a patient who experienced chest pain at home may be asymptomatic during the assessment in the ER, only to develop severe chest pain and magnificent ST elevations a few minutes later. It is important to note that a traditional 12-lead ECG only present a few seconds of myocardial electrical activity and there is a chance that ischemic episodes are missed. Indeed, studies (with continuous ST segment monitoring) show that 60% to 75% of ischemic episodes during acute coronary syndromes are asymptomatic. Therefore, it is recommended that repeated 12-lead ECGs be performed in the ER as well as in the ward. Patients at high risk of acute coronary syndromes should be observed with continuous ECG (ST segment) monitoring. Continuous assessment of ST-T changes increases the probability of discovering ischemic ECG changes. Stable angina pectoris occurs when an atherosclerotic plaque causes at least 70% stenosis of the coronary artery. Plaques causing less than 70% stenosis rarely cause stable angina pectoris. Although 70% may appear as much, it is not sufficient to cause ischemic ST-T changes at rest (i.e on resting 12-lead ECG). An exercise stress test with treadmill or bicycle is needed to reveal ischemic ECG changes in patients with stable angina pectoris. The increased myocardial workload during exercise can provoke ischemia and thus ischemic ST-T changes (ST depressions and T-wave inversions). In summary, stable coronary artery disease (angina pectoris) cannot be diagnosed with resting 12-lead ECG. The ECG is invaluable in the prehospital setting. It is used to diagnose, risk stratify and guide treatment in patients with acute coronary syndromes. The 12-lead ECG, with conventional electrode placement, should be used in the prehopsital setting. Occasionally, prehospital personnel place the limb electrodes on the torso (i.e Mason-Likar electrode placement). This results in an almost identical ECG as the conventional 12-lead ECG, but only almost. The Mason-Likar electrode placement is not approved for interpretation of ischemia on the initial recording (because amplitudes and intervals may differ from conventional 12-lead ECG). However, Mason-Likar electrode placement may be used for ECG monitoring (which is discussed later). A diagnosis of myocardial infarction/ischemia can be made already in the prehospital setting. Time to interventions is reduced because the diagnosis is established earlier. The coronary care unit or catheterization laboratory may be prepared early. Time to reperfusion therapy (thrombolysis or PCI) is reduced. Time to administration of evidence based medications (beta blockers, statins, aspirin, ticagrelol, clopidogrel etc) is reduced. It is highly likely that mortality is reduced. The prehospital ECG is also an excellent reference ECG to which future recording (for example in the ER) may be compared with. It should be noted that mortality among patients using the EMS (emergency medical system) is usually higher than those capable of transporting themselves to the ER. This is explained by the fact that those utilizing the EMS are older and have more comorbidities. In some studies from the US almost 50% of patients who called the EMS due to chest pain have ischemic ECG changes. As discussed above, acute coronary syndromes are dynamic processes and the coronary blood flow may change rapidly. Changes in coronary blood flow has an immediate effect on myocardial membrane potential and thus the ECG. Continuous ECG monitoring allows for uninterrupted assessment of myocardial perfusion. The size of the thrombus, and thus the extent of ischemia, is reflected primarily on the ST-segment. Any deviations in the position of the ST-segment (either ST-segment elevation or ST-segment depression) is suggestive of myocardial ischemia. Continuous ECG monitoring is superior to repeated 12-lead ECGs, which only present a few seconds of myocardial activity. The probability of detecting asymptomatic ischemic episodes (which may constitute 60–75% of all ischemic episodes in patients with acute coronary syndromes) is markedly increased by using continuous ECG surveillance. 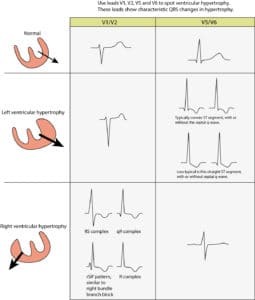 However, in patients with marked secondary St-T changes due to other conditions (e.g left bundle branch block) the utility of continuous ECG monitoring is much lower and it is usually not performed. ST segment monitoring is done either by means of 12-lead ECG (with limb electrodes placed on the torso according to Mason-Likar) or vectorcardiography (VCG). It was mentioned above that interpretation of ischemia is not recommended on any lead system but the 12-lead ECG. This is true with respect to establishing a diagnosis on the initial recording. For monitoring purposes however, the initial recording is not interesting, only the changes over time, which is why Mason-Likars electrode placement is suitable. Placement of limb electrodes on the torso results in fewer artefacts from limb muscles. Besides VCG and Mason-Likar 12-lead ECG, there are other lead systems for monitoring (e.g EASI and TruST). Patients with NSTE-ACS should be monitored until 24 hours after the last ischemic episode. The number, magnitude and duration of ischemic episodes must be noted in patients waiting for angiography. The more the ischemia, the faster the angiography is needed. In patients with unstable angina pectoris, absence of ischemic episodes during 12 hours suggests that the condition has stabilized.